Yep this week’s This Week I’ve Been post is a little later than usual, but that’s because I knew that Sunday was going to be such good fun then I had to wait until afterward to write it! This week feels like it’s been really productive, and for me, a productive week usually means a messy house (because I’ve been too busy to tidy!) so the bombsight that is my blogging room (and my desktop too) is evidence of a super busy week! Visiting the new Origins counter in John Lewis. On Wednesday evening the lovely ladies at Origins invited a small group of bloggers to the John Lewis store on Oxford Street to preview their new retail concept. The fabulous new counter is all about encouraging the customers to explore the brand, either by discovering the ingredients which are in the products, or trying out mini sachets of the product (yes that’s right, free samples!). One thing I love is that they also offer free mini facials / skincare consultations, so it’s the perfect place to discover more about one my absolute favourite brands! Celebrating my 3 year anniversary with Charlie. This week the official date that Charlie and I started dating passed, and we celebrated with a fabulous meal at Barbecoa – Jamie Oliver’s Barbecue steak house in St. Pauls where we both devoured more than our combined body weight in meat… mmmmm. Having a girls’ day out with Hayley, Meg and Zoe. On Saturday the four of us got together for a day of outfit picture taking and ice cream – we had so many giggles that it truly is a shame that none of us does daily vlogging, as I’m sure that our antics would have gone viral instantly! Enjoying scrumptious tapas & wine at Copa de Cava. Tucked away on the cobbled side streets near St Pauls, this week I discovered Copa de Cava – a little bit of Spain in a charming candle lit cave. The restaurant endeavours to bring the ‘life, soul and taste of Spain’ to London and it certainly made us feel as though we had been whisked to a traditional tapas bar on one of Barcelona’s side streets. We loved the laid back atmosphere, and the staff where very knowledgable about which wine to have with our food. There’s a huge selection of tapas on offer, we tucked into Patatas Bravas, a selection of Jamon Iberico, some scrumptious manchego, croquetas, as well as calamari and spinach parcels. All small portions but if you order a generous amount then you’re in for a treat as all the dishes are delicious! Marching with Benefit, #BoldisBeautiful. Just yesterday, Mum and I woke up early and headed for Oxford Circus for 9.30am to meet the Benefit team (and 300 other walkers!) for the Bold is Beautiful march through London. Not like any other march, oh no, Benefit had organised an extravaganza complete with singing Benebabes on stage at the start line, makeup stations for topping up your look during the march, oh and capes and brow spectacles to proudly wear as we marched up Regent Street! 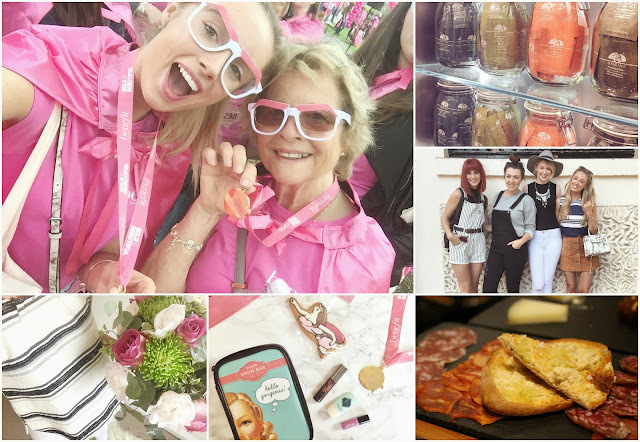 It was a super way to spend the morning and the best part is, we were all raising money for Refuge and Look Good Feel Better charities – both super causes, click on the links to find out more about the inspiring charities. P.S My Beauty Hacks video went live yesterday, check it out here!